Get old-time hot-rodders together and utter the name "Turbonique." The entire conversation will shift to legends and half-truths of the '60s company supposedly created by NASA subcontractors to create a consumer market for rocket technology. Now there's video. ...mere mention of the name "Turbonique" still inspires a shudder of awe among drag racing enthusiast, the company's principle target market. Even in the Wild West atmosphere of 1960s drag racing, Its products represented the zenith of no-compromise, crazyass crazy. Recall Acme, that enigmatic mail order purveyor of catapults and jet skates to cartoon coyotes? Pikers, compared to Turbonique. The term monopropellant describes a fuel that will ignite and burn without the presence of atmospheric oxygen. As a point of comparison, the nitromethane used in Top Fuel dragsters is a semi-monopropellant. It requires a little outside oxygen for complete combustion, but only a small fraction of what is required to burn gasoline, alcohol, or kerosene. Most gas turbines run on petroleum-based fuels that require plenty of air to support combustion. They take in atmospheric air at the front and compress it to a high temperature and pressure. Fuel is then sprayed into this hot air, which ignites, creating the high-pressure gases that drive the turbine wheel and make torque. The problem is that a typical air-breathing gas turbine uses over half of its total turbine power to drive the compressor. Turbonique engineers sidestepped the problem and simply replaced the weighty, expensive, and inefficient compressor with a high-pressure storage bottle containing Normal Propyl Nitrate (Thermolene), a stable, milk-white liquid fuel that brings its own oxygen to the party and that moves the engine into the category of a rocket because it can run without the benefit of atmospheric oxygen. When the Thermolene is introduced to the combustion chamber at 600 psi and ignited by a glorified spark plug connected to an on/off switch, the immediate result is an intense release of hot gases to spin the turbine blades. Anti-swirl turbine wheel vanes prevented flames from exiting the tailpipe, but a special wheel was optional for "spectacular flaming night runs." "This is so ridiculously awesome," were the words delivered in a quiet whisper when we first saw these videos procured by the boys at Bangshift. 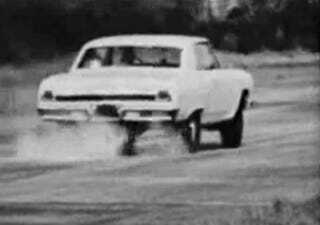 We've seen Turbonique products before on cars like the lustworthy Rocket Drag Axle equipped 1964 Ford Galaxie 500, but we never thought there was actual video of these things in action. Naturally we assumed anyone involved in racing or filming this stuff would've been consumed in a tremendous conflagration of Thermolene, but such is not the case. These two videos contain an explanation of the Turbonique system and silent footage of probably one of the most legendary drag races associated with Turbonique: "The Black Widow," a VW Beetle equipped with a Rocket Drag Axle, up against "Showboat," Tommy Ivo's unbelievable quadruple Buick-engined dragster. How about a rocket-powered, propeller driven go-kart or a quick-change rocket-powered supercharger sucking fuel through a giant carb and dumping it into an otherwise stock Barracuda? No? How about a tiny rocket powered boat? Rocket powered hovering platform? All were a possibility thanks to the same space-age know-how that gave us astronaut ice cream. But as many users quickly discovered, there was too much power [in Thermolene-fueled dragsters]. Extreme tire spin (even on the best slicks of the day) made Drag Axle-equipped cars difficult to control. Full-quarter-mile smoke shows with impressive trap speeds, but mediocre elapsed times were the rule, not the exception. Regardless of whether Turbonique was onto something big or not, it all came to an end in the early '70s. Though efforts to contact company founder Gene Middlebrooks for comment were fruitless, persistent, but unconfirmed, rumblings about allegations of mail fraud and prison terms keep surfacing as a sad postscript to the Turbonique saga. These men were truly giants, and the world is a colder place without them.